Best Selling Author KaToi Love is a business owner and author of the Best selling ... Hot New Release "Cursed by the Candy, "published by PrintHouse Books. 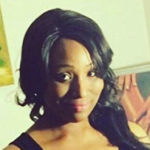 Author KaToi was born in Washington DC, however was raised in Brockton Ma and Norfolk VA. She currently resides in Charlotte NC. KaToi, loves to empower women with her greeting card apparel company, Street Confessions words from the Soul. This Entrepreneur has had the opportunity of being a featured writer in several magazines and celebrity entertainment blogs.